Washington (AFP) – Defense Secretary Jim Mattis said Friday that America is facing “growing threats” from China and Russia, and warned that the US military’s advantages have eroded in recent years. Mattis’s assessment came as he unveiled the Pentagon’s vision for the future detailed in a document called the national defense strategy. “We face growing threats from revisionist powers as different as China and Russia, nations that seek to create a world consistent with their authoritarian models,” Mattis said. “Our military is still strong, yet our competitive edge has eroded in every domain of warfare — air, land, sea, space and cyberspace — and is continually eroding,” he added. President Donald Trump and his administration worry that the vast US military force is feeling the effects of years of budget shortfalls and atrophy, and needs a full reboot to restore it to an idealized strength. Part wish list, part blueprint for the coming years, the Pentagon’s national defense strategy seeks to increase the size of the military, improve its readiness and work with allies — all while operating across multiple theaters including in Europe, the Middle East and Asia. “This strategy establishes my intent to pursue urgent change at significant scale,” Mattis wrote in the introduction to the strategy. “It is regrettable that instead of having a normal dialogue, instead of using the basis of international law, the US is indeed striving to prove their leadership through such confrontational strategies and concepts,” Lavrov told a news conference at the United Nations. 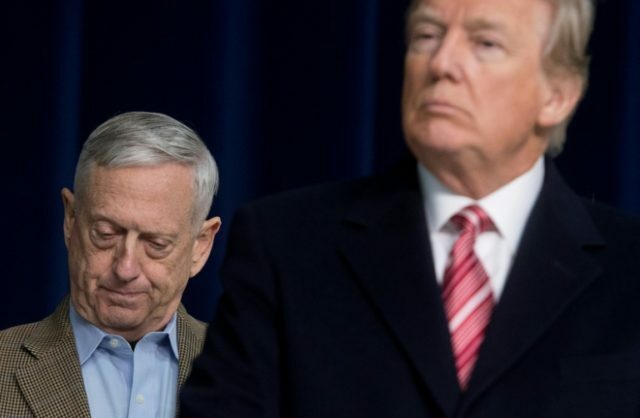 Elbridge Colby, the US deputy assistant secretary of defense for strategy and force development, told reporters that Mattis’s strategy seeks to deal with the “erosion” of America’s military advantage. “What it is recognizing is that China and Russia in particular have been assiduously working over a number of years to develop their military capabilities to challenge our military advantages,” he said. The new defense strategy follows on from Trump’s national security strategy that he released last month which, similarly, highlights the role of China and Russia in the global security environment. “China is a strategic competitor using predatory economics to intimidate its neighbors while militarizing features in the South China Sea,” Mattis wrote. “Russia has violated the borders of nearby nations and pursues veto power over the economic, diplomatic and security decisions of its neighbors,” he added, while also pointing a finger at Iran and North Korea for their threats to peace. Trump’s security strategy contrasts with the friendly nature of his first state visit to Beijing in November, when he received a lavish welcome and repeatedly praised President Xi Jinping. One of the biggest criticisms inside the Pentagon and on Capitol Hill is that the US military is suffering from a lack of readiness, where troops and gear are not getting the training or maintenance they need. Mattis said the United States must be ready to fight a war. “The surest way to prevent war is to be prepared to win one,” he said. Mattis’s strategy also calls for greater coordination with allies, who Trump on the campaign trail lambasted for not doing enough to share the burden of defending the post-World War II order. “We expect European allies to fulfill their commitments to increase defense and modernization spending to bolster the alliance in the face of our shared security concerns,” Mattis said, in reference to NATO countries paying more into their defense budgets. “A new era of great power competition has emerged, and this strategy prioritizes that reality,” he said in a statement. The document makes no mention of climate change, which under former president Barack Obama was recognized as a national security threat. Trump has claimed climate change is a hoax and pulled the US out of the historic climate accords in Paris.